Moving towards Industry 4.0 with Automation and Smart Factory Monitoring. Through continued re-investment, Velden has been working to become a modern “Smart Factory” in line with cutting edge Industry 4.0 business methodologies. 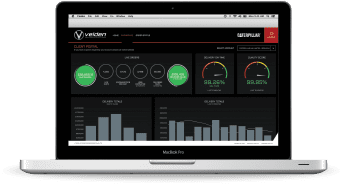 The company has further extended its in-house developed ERP system to incorporate IoT (Internet of Things) comprehensive machine tool monitoring and EDI direct data interchange with its customers. In addition Velden has invested over £2m in the last 2 years on the latest production machinery, factory automation including multiple robot loading units, camera & laser vision inspection systems, intelligent energy saving LED factory lighting and solar generating technologies. 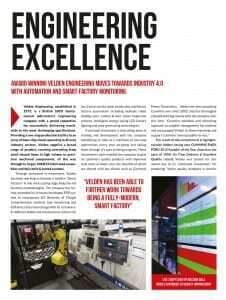 The result of this commitment is highlighted with Velden having won CUMMINS EMEA PGBU 2015 Supplier of the Year Award on the back of 100% On Time Delivery & Excellent Quality record. Through its commitment to future investment and continual improvement, Velden is now looking to maximise opportunities and attract enquiries from like-minded blue chip customers.